For professional help and advice in every aspect of waste management plans, waste auditing, waste monitoring, waste reporting and waste assessment , you need experts who understand the needs of your business. Over the past 25 years, Waste Audit and Consultancy Services have developed a range of services and tools to assist clients in achieving their waste management objectives. Whether you want to achieve cost savings, environmental improvements, stakeholder involvement or legislative compliance, Waste Audit and Consultancy Services can assist you. 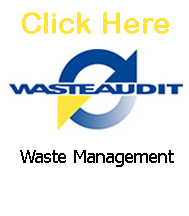 Click on the logo to the left to find out how we can help you with waste management.